Methow Valley Theater Presents: Oklahoma! 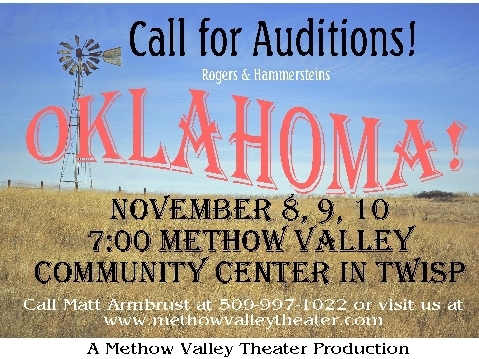 Audition deadlines have passed, but mark your calendars for the Methow Valley Theater production of Oklahoma! Set in the Oklahoma territory in the early 1900’s, this musical comedy includes such memorable numbers as “Oh What a Beautiful Morning”, “The Surrey with the Fringe On Top”, “I Can’t Say No”, and more. It is a love story set in the wide and wild landscape of the Oklahoma prairie. Much of the production, such as the musical number, “The Farmer and The Rancher Should Be Friends” is something we in the Okanogan can relate to. It is a timeless love story. It is Americana, decorated with love and dance and music.